Credit: David Nidever et al. NRAO/AUI/NSF and Mellinger, Leiden-Argentine-Bonn Survey, Parkes Observatory, Westerbork Observatory, Arecibo Observatory. 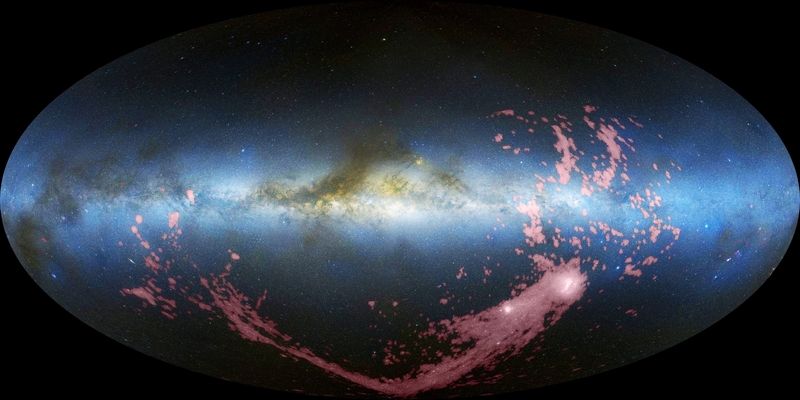 The Milky Way may have found a solution to its gas shortage. Astronomers had calculated that our home Galaxy possesses only enough fuel to forge new stars for just a few billion more years. But scientists have now discovered that a long stream of gas falling into the Milky Way is four times as massive as previously thought and could power our Galaxy's star-making career for a long time to come. "It's a very beautiful study with surprising results," says Leo Blitz of the University of California, Berkeley, an astronomer who was not part of the project. Astronomer Andrew Fox of the Space Telescope Science Institute in Baltimore, Maryland, and his colleagues made the discovery while studying a stream of gas shed by two nearby galaxies, the Large and Small Magellanic Clouds, which orbit the Milky Way. The lost Magellanic gas stretches over more than half a million light-years of space, and much of it will fall into our Galaxy's disk, supplying fuel for new stars. Astronomers discovered this gas long ago because it contains hydrogen, the most abundant element in space. But this gas isn’t always easy to detect. It comes in different varieties. One is a neutral, or nonionized, form, in which each proton has an electron; this type of gas emits 21-centimeter-long radio waves that radio telescopes readily spot. But the gas also comes in an ionized form, in which electrons are free of protons; this type of gas doesn't emit these radio waves and so can be much harder to detect. To see whether this second type of gas was falling into the Milky Way from the Magellanic Clouds, Fox's team used data from the Hubble Space Telescope. The astronomers examined 69 distant quasars and active galaxies that lie behind the gas, to measure how much of their ultraviolet light ionized gas from the Magellanic Clouds absorbs. To their surprise, Fox and his colleagues detected so much absorption of the background ultraviolet light that they concluded the Magellanic Stream must contain far more ionized gas than neutral gas. In The Astrophysical Journal, the team quadruples the estimated amount of gas the Magellanic Clouds have lost. Whereas previous work indicated that the hydrogen gas was half a billion times as massive as the Sun, Fox's team puts the number at 2 billion solar masses. Because the gas also contains other elements—especially helium, the second most abundant element in the universe—the grand total approaches 3 billion, and it’s greater still if much of the stream lies farther than the Magellanic Clouds, as astronomers suspect. "It's the best job ever" of measuring the Magellanic Stream's mass, says astronomer Bruce Elmegreen of the IBM Research Division in Yorktown Heights, New York. "There's more than enough to keep the [Milky Way's] star formation rate going at its current value." Thus, our Galaxy can keep creating new suns far into the future. All of this is great for the Milky Way, but what about other spiral galaxies facing gas shortages? "We're very atypical," Fox says. Most other giant spirals lack large, close-in, gas-rich satellite galaxies like the Magellanic Clouds. But Fox suspects that other giant spirals also get replenished when gas-rich satellites fall toward them; we just happen to live in one of the few galaxies where this process is occurring today, giving astronomers a ringside seat on the refueling of a giant galaxy.